DUMBARTON lost a crucial chance to move ahead of Queen of the South into the fourth play-off spot when they lost 3-0 to the Doonhamers at the Bet Butler Stadium. DUMBARTON lost a crucial chance to move ahead of Queen of the South into the fourth play-off spot in the SPFL Championship when they lost 3-0 to the Doonhamers at the Bet Butler Stadium. A crowd of nearly 1,300 saw Ian Murray's men battle against the full-time visitors, who are managed by Dumbarton man Jim McIntyre who has former Dumbarton manager Gerry McCabe as his no.2. The local connection continued when ex-Son Iain Russell headed over keeper Jamie Ewings to open the scoring. Colin Nish then beat Queens keeper Zander Clark, but his strike was ruled out for offside. Although possession was about 50-50, the visitors carried much more goal threat, and this was demonstrated early in the second half with two goals in seven minutes. The first came when Dumbarton missed a chance to equalise and the visitors broke away at pace, Russell setting up Derek Lyle to make it 2-0. Then Kevin Holt made it three with a dipping volley from outside the box. Sons tried to get back into it, throwing on several subs, but never really looked a threat in front of goal. So Queens are now three points ahead in fourth place with only two games to go. 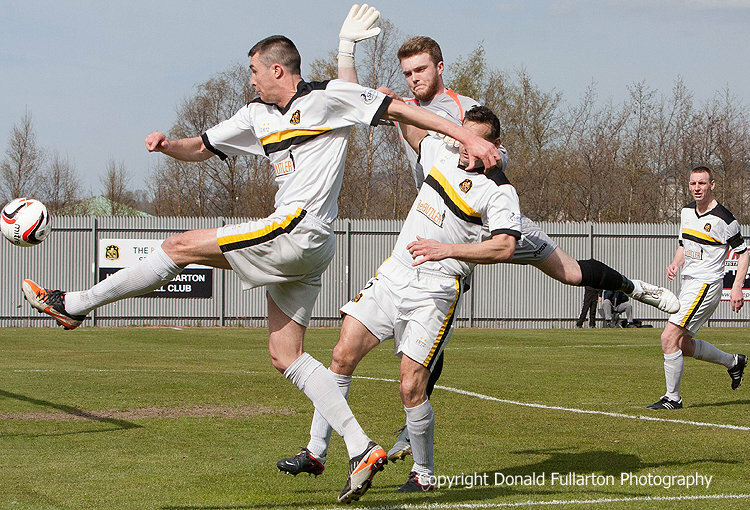 The picture shows a Colin Nish effort which went over the bar.